Thai Airways is increasing focus on transit traffic, including in the highly competitive Australia-Europe market, as part of the latest phase of its transformation plan. 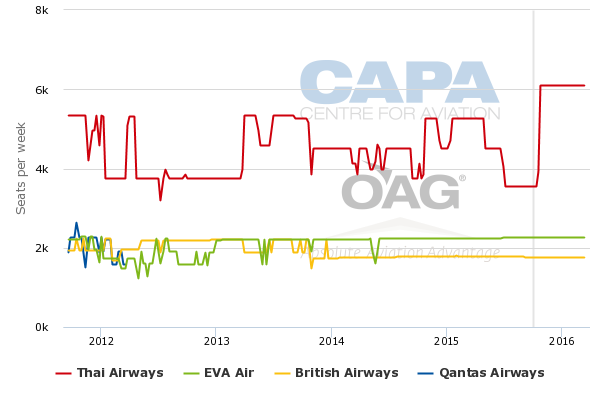 The flag carrier is maintaining capacity to Australia while most Southeast Asian competitors have cut back and has reversed some capacity cuts to Europe that were implemented in an earlier phase of its restructuring. Thai remains in restructuring mode but by some measures is growing again. Capacity is increasing slightly as aircraft utilisation rates improve and as the planned retirement of eight 747-400s has been postponed. 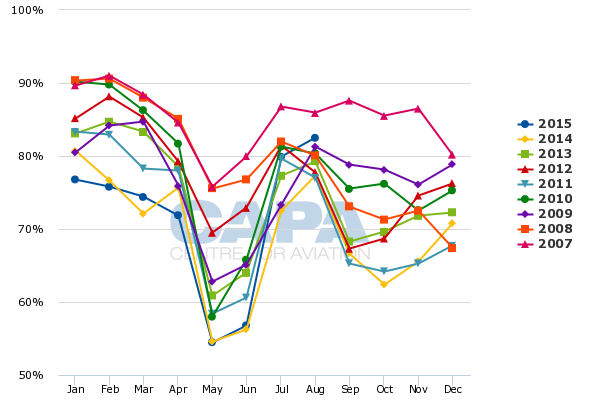 Passenger traffic is growing at an even faster rate as load factors recover after a dismal 2014. Thai expects further load factor gains as well as yield improvements driven by a new initiative to improve network connectivity and boost sales in city pairs where its market share has languished. This is the first of a two part series of analysis reports on Thai Airways. This part will focus on changes to its fleet plan, in particular its decision to delay 747-400 retirements, and an upcoming capacity increase to Europe. The second part will focus on Thai's new commercial strategy, which includes an increased focus on transit traffic. The Thai Airways Group, which includes regional full-service subsidiary Thai Smile, currently operates a fleet of 94 aircraft to about 80 destinations. This includes 74 widebody aircraft and 20 narrowbody aircraft. Thai Airways has been reducing and streamlining its fleet over the last year as part of a major transformation initiative aimed at reducing losses and improving the flag carrier’s long-term sustainability. The group began 2015 with a fleet of 102 aircraft, including and 19 narrowbodies and 83 widebodies. Over the first three quarters of 2015 Thai has phased out 14 aircraft, including six A330-300s, six A340-600s and two 747-400Fs. The group no longer operates any A340-600s or 747-400Fs, reducing its fleet to seven types (or 10 types when including separately the four variants of the 777 that Thai operates). As part of its restructuring Thai Airways has sold 17 aircraft so far this year and is aiming to sell another 19 aircraft by the end of 2015. The 36 aircraft being sold in 2015 include aircraft that were grounded prior to the start of the current restructuring, including ATR 72-200s, A300-600s and A340-500s (some of these aircraft are listed in the table below as in storage as they have not yet been sold). The Thai Airways Group has taken delivery of six aircraft through the first nine months of 2015, including three 777-300ERs, two 787-8s and one A320. Therefore the net reduction in the fleet has been eight aircraft, from 102 to 94. The most recent 777-300ER, which was delivered in Sep-2015, is the last of Thai's 14 777-300ERs commitments while the two 787-8s, both of which were delivered in 2Q2015, are the last aircraft from its 787-8 commitment. The group has two more aircraft deliveries slated for 4Q2015, both of which are A320s for Thai Smile. These are the last of 20 commitments for the A320. Thai Airways was initially planning to cut its fleet by at least another eight aircraft in 2015 and end the year with less than 90 aircraft. The group is now expected to end the year with 96 aircraft, including 74 widebodies and 22 narrowbodies. Thai Airways CEO Charamporn Jotikasthira told CAPA that the group has decided to continue operating eight 747-400s that had been identified in the initial transformation plan for retirement in 2015. The fleet plan Thai released in early 2015 envisioned Thai Airways reducing its 747-400 passenger fleet from 12 to four aircraft in 2015 with the final four aircraft slated to be phased out in 2017 and 2018. Thai Airways now plans to continue operating 12 747-400s, which are in 375-seat three-class configuration, for at least another year and probably longer. The group sees its 747-400 fleet as a flexible asset as the aircraft are unencumbered and Thai already has a large group of crew already trained for the type. Low fuel prices also obviously make 747-400 operations more appealing. In previous analysis reports on Thai’s restructuring CAPA has stated that retirement of the 747-400 and the 737-400 fleets would be logical steps in line with Thai’s initiative to simplify the fleet and improve efficiencies. Thai has just two remaining 737-400s, which are slated to be phased out in 2017 and are now used only to operate services to Samui, where runway restrictions preclude A320s. But Thai at this point has no qualms about keeping the two ageing types in the fleet. Mr Charamporn said it does not cost much to continue operating 747-400s and it was necessary to keep the eight 747-400s in the fleet after Thai decided to add back capacity to Frankfurt and London Heathrow. In early 2015 Thai decided to reduce Frankfurt and London from two to one daily flight from summer 2016 – although the reduction in capacity to London was offset partially by up-gauging the remaining frequency to the 507-seat A380. Retiring the eight 747-400s as originally planned would have forced Thai to further reduce European capacity or quickly acquire more new widebody aircraft. But Mr Charamporn said Thai is not currently considering acquiring any additional new aircraft as it is still focusing on completing its restructuring. Thai currently only has two aircraft deliveries for 2016, both A350-900s, giving it limited opportunity to add back capacity in the near term if the eight 747-400s were retired. The other 10 A350-900s Thai has committed to acquiring are slated to be delivered until 2017 and 2018 while its two 787-9s are also slated for 2017. Reducing Frankfurt and London was part of the first phase of a network restructuring which also included dropping service to Johannesburg, Madrid and Moscow. A second and final phase is being implemented over the next few months with the suspension of services to Los Angeles and Rome. Mr Charamporn does not expect any additional restructuring of the network will be required although noted it will take 18 months to fully implement the reduction in headcount, which is another key component of the turnaround plan. The network cuts reduces Thai’s long-haul network to only 10 long haul destinations – Brussels, Copenhagen, Frankfurt, London Heathrow, Milan, Munich, Oslo, Paris, Stockholm and Zurich. Johannesburg had been Thai’s only destination in Africa while Los Angeles, which is now being served with four weekly flights via Seoul, is Thai’s only destination in the Americas. Service to Los Angeles is terminating in late Oct-2015 while Rome is now slated to be dropped in Feb-2016. Mr Charamporn says all the suspended destinations are seen as temporary measures and could be resumed when market conditions improve. But there is no definitive timeframe for resuming any of the suspended destinations. Re-entering a long-haul market is always a difficult proposition as typically the void is quickly filled by other airlines. Adding back capacity to a market that has been reduced rather than dropped entirely is much easier. But it is somewhat surprising Thai has added back capacity to Frankfurt and London so quickly given the company still sees itself in a restructuring rather than growth mode. In London, Thai’s capacity for the upcoming northern winter season will be at historical highs. Thai will serve London Heathrow from late Oct-2015 with one A380 flight and one 777-300ER flight, providing almost 6,000 weekly one-way seats. Prior to cutting back to one frequency in early Jul-2015 Thai served London with a mix of 747-400s and A340-600s, providing about 4,500 weekly seats. The Bangkok-London market is also served with two daily 777 fights from British Airways and one daily 777 flight from Taiwan's EVA Air. Overall Thai will have almost 34,000 weekly one-way seats to Western Europe in Dec-2015. This represents about a 2% increase compared to Dec-2014 and about a 4% increase compared to Dec-2013, according to CAPA and OAG data. Thai’s current seat capacity to Western Europe (based on schedules for the week commencing 28- Sep-2015) is down about 6% year over year. For Aug-2015, Thai reported a reduction in European ASKs of 10%. This figure includes the impact of the Moscow suspension, which had been Thai’s only destination in Eastern Europe, but does not include the impact of the Madrid suspension. Moscow was dropped at the end of Mar-2015 while Madrid was dropped in early Sep-2015. Neither destination was served daily. Thai will not decide on capacity levels for summer 2016 until Jan-2016. Thai could potentially again reduce Frankfurt and London in summer 2016 or decide to keep two daily year-round flights in these markets. A further delay in the suspension of services for Rome is also possible. Thai initially announced in Jul-2015 that Rome would be cut from late Oct-2015 but has since decided to maintain Rome until Feb-2016. Rome could potentially be maintained as a seasonal destination or even as a year-round destination. By keeping the eight 747-400s in its fleet, Thai will have the flexibility to offer more seat capacity to Europe in summer 2016 compared to summer 2015. Maintaining capacity to Europe is strategically important for Thai as Thailand is facing a potential downgrade by EASA following the determination made by ICAO against the Thai DCA. In the event of a downgrade Thai will be unable to increase capacity to Europe but will be able to maintain current capacity. Thai does not want to risk being caught for a potentially extended period of time with low capacity levels to Europe, a factor behind its decision to add back capacity. Airports slots was also a factor, particularly Thai’s two slot pairs at Heathrow. Thai did not want to relinquish or sell one of its slot pairs at Heathrow as reacquiring slots later would be challenging. Thai also decided to add back the second flight to Frankfurt and London because it is confident it now has the right commercial strategy in place to sell the capacity. “After about six months reduction and some adjustments we are confident we can get the load factor back on all those flights,” Mr Charamporn said. In 2014 Thai’s load factor on European routes was only 69.6%, prompting the airline to adjust capacity. Thai’s load factor on European routes improved to 72.1% through the first eight months of 2015, including 82.5% in Aug-2015. Thai’s new commercial strategy gives the group confidence it can further improve load factors to Europe – and system-wide – even as capacity is added back. This strategy, which includes an increased focus on network connectivity and transit traffic, will be examined in the second instalment in this series of reports.